ophion1031 wrote: I wonder how he got away with driving a car with no plates. Maybe he took the plates off whenever he was at home and then put them back on when he drove it? That would be very suspicious. That would be my guess. Probably not all that uncommon back then. 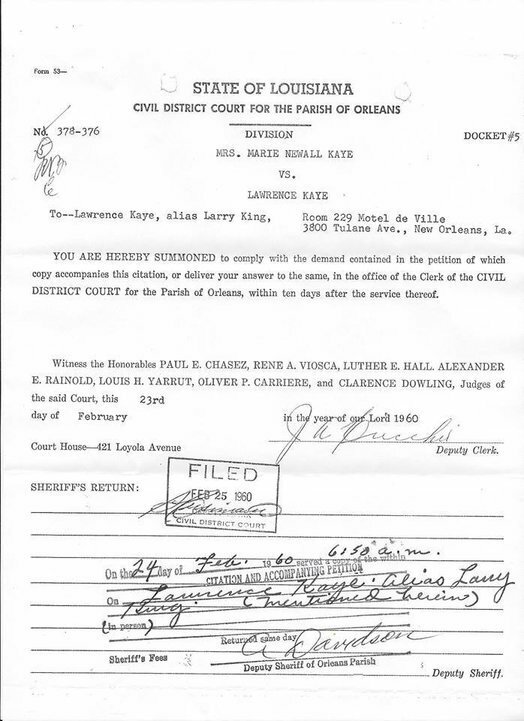 Kane possessed multiple fraudulent driver's licenses and identification cards. Consequently, it doesn't seem like too much of a stretch to suggest that he may have used false plates. If only we knew half of the skeletons in Kane's closet. Rocketman wrote: If only we knew half of the skeletons in Kane's closet. Wouldn't that be something. And I bet there are a ton. Probably more than any other Z suspect. On paper, Arthur Leigh Allen is probably the best suspect, but Kane is right up there. Very good finds!! Do you happen to know how Philip died? Could be foul play of some sort since he was only 30. And we have another alias, King. Don't think that one was mentioned before. I wonder if Philip used different spellings of his last name. 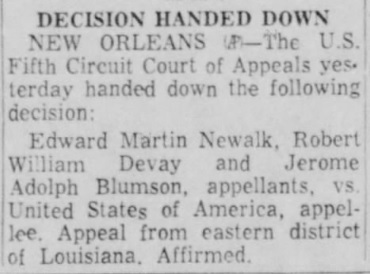 There is a Philip Oscar NEWELL Jr. in New Orleans. Other than that, I haven't found a whole lot of Newall. It is a young age to die, so it makes ya wonder if he died mysteriously or maybe had cancer or something. There was cancer "research" going on in and around New Orleans at the time, so it wouldn't surprise me if they injected random people with cancer cells without them knowing. "There was a Broadway showgirl named Rosemary Williams (aka Williamson) who 'allegedly' used the name "Marie Newell." She garnered some minor repute in the late 1940's as an actress and fashion model. 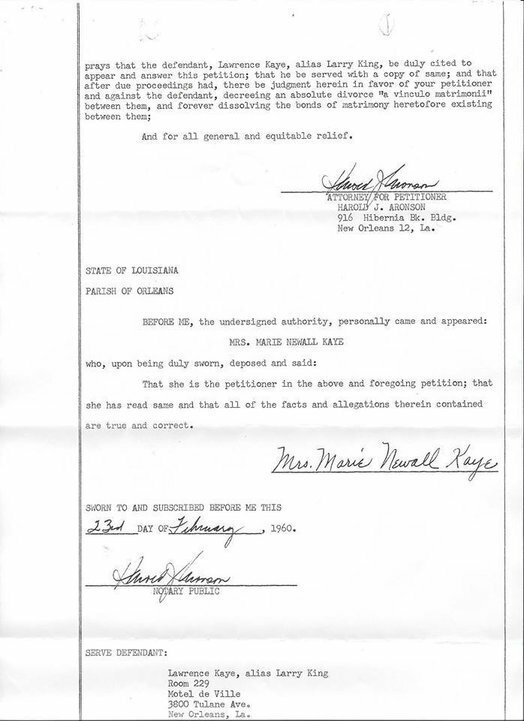 She and Kaye moved in the same circles, and apparently frequented some of the same clubs, which lead me to speculate about a possible connection between her and Marie Newall/Newhall. I'm not as enthusiastic about (or as committed to) this theory as I was initially, so I’m holding out hope that the divorce papers will either bolster or dispel it…which, at this point, doesn’t seem especially likely." Marie was born in 1931 and would have been in her late teens in the late 1940's, so it is possible that the quote from T.M. is correct. Perhaps she is the reason Kane ended up in Louisiana? This is Marie's father, Vasal Brown. Born July 13, 1907 and died June 2, 1939. He also died in his early 30's. ophion1031 wrote: I wonder if Philip used different spellings of his last name. 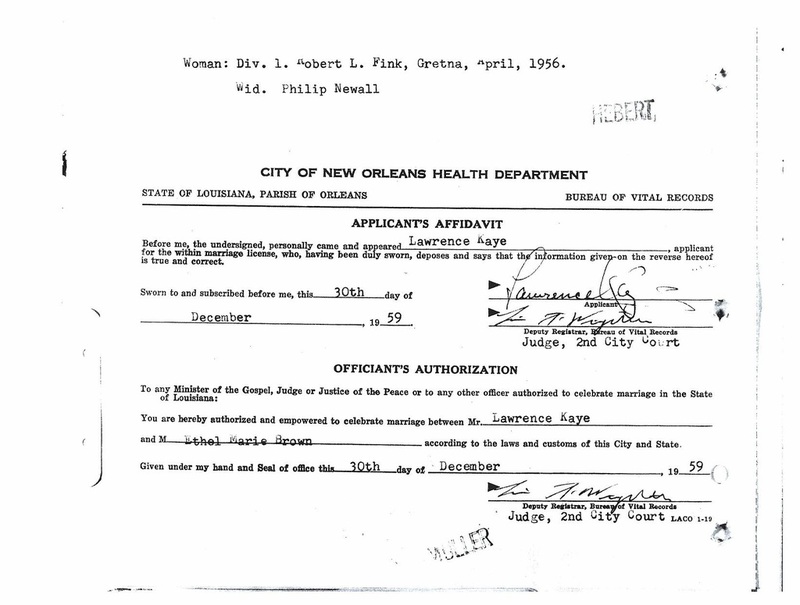 There is a Philip Oscar NEWELL Jr. in New Orleans. Other than that, I haven't found a whole lot of Newall. It is a young age to die, so it makes ya wonder if he died mysteriously or maybe had cancer or something. There was cancer "research" going on in and around New Orleans at the time, so it wouldn't surprise me if they injected random people with cancer cells without them knowing. That was me. I've subsequently recanted that theory. Marie and Philip worked in the home construction industry. 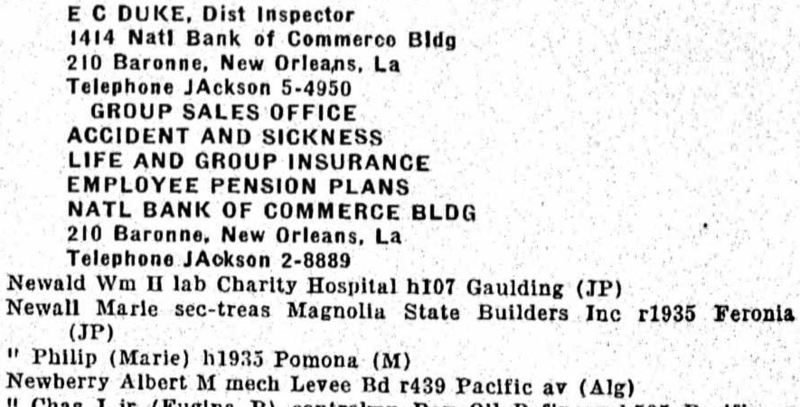 I assume this was their connection to Kane - Kane having variously been employed as a siding salesman/representative, real estate broker, and building contractor. 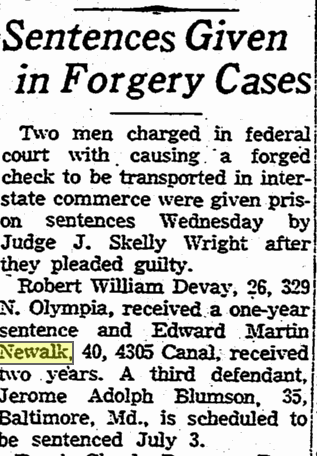 Philip's real name, so far as I know, was Newalk. Ahhhh, that was you? Gotcha. Newalk? Maybe that is why I had such a difficult time finding info on the guy. I wonder where the "Fink" comes in to play for Marie. Maybe that was her first husband's name? Philip was her second husband, and Kane her third. Looks like Philip was born in NY (approximately 1927 or 1928) and the family was living in Manhattan in 1930. I wonder if the family moved out of state later, or if Philip moved on his own as an adult. Maybe he knew Kane? Maybe even as far back as childhood? Kane is probably 3 or 4 years older than Philip, but they could have lived close to each other. I guess none of that is relevant, probably. 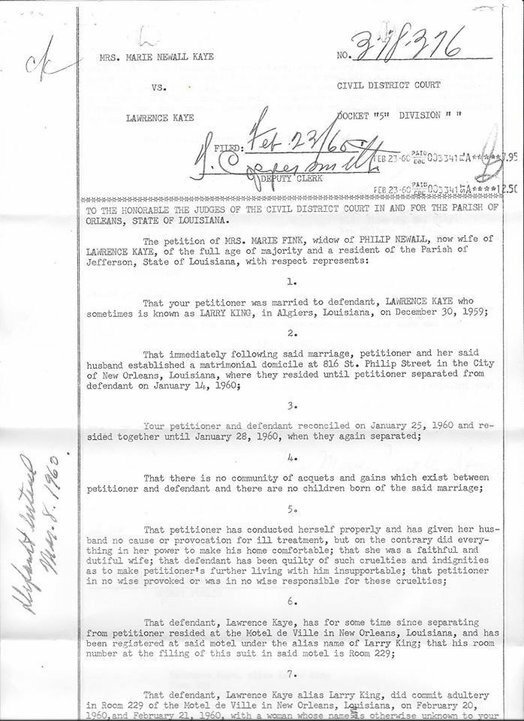 Philip Newalk petitioned to have his name changed three months later. I suspect (but obviously can't prove) that this incident was the impetus for that change. I don't know how yall find all this stuff but kudos. It would appear that Edward went back to New York after Philip passed away or maybe a year or two after. 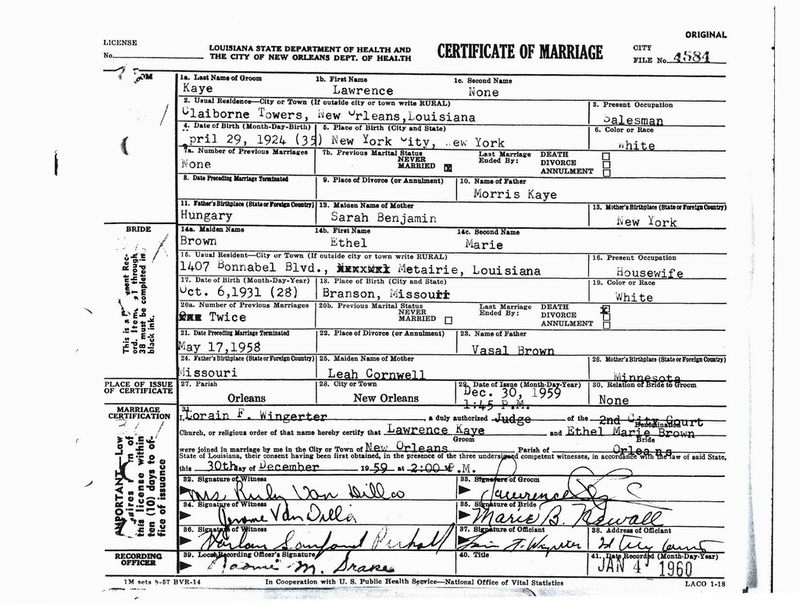 Edward had a wife and daughter in 1958 I wonder if they lived with him in Louisiana or if they were left behind in New York. But we don't know why Edward was in Louisiana or for how long exactly. We could explore Philip more and try to find out what kind of activities he was getting into. Just noticed that Edward got a two year sentence so I guess he was locked up from 1958 until 1960 and then was back in New York in 1961. So who moved to Louisiana first, Philip or Edward? Edward seems like the type that would be a friend of Kane. How crazy would it be if Kane actually met Marie from being friends with Philip and/or Edward? Edward's daughter was old enough to be out on her own by 1958. I'm not sure when his son Rick was born. Philip's death is the one thing I want to find more information on. He died just a few weeks before Edward's sentencing. 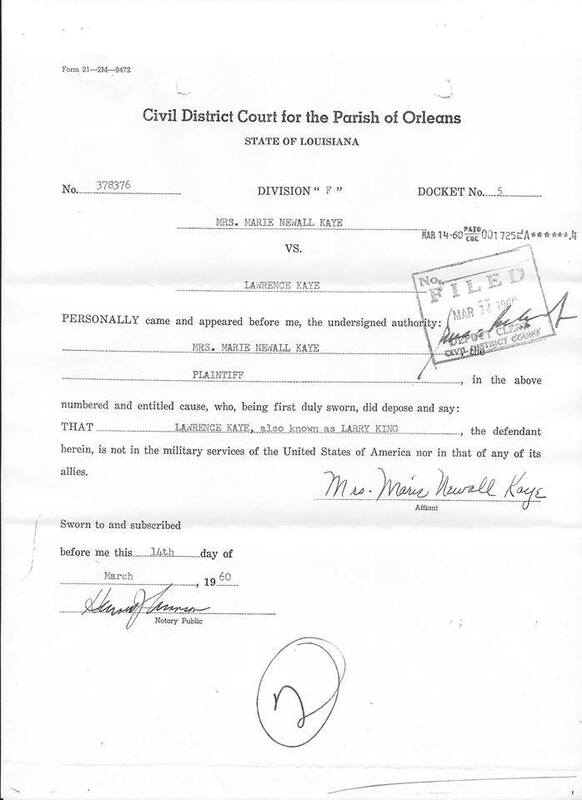 Kane had a fraudulent Licences etc but did Have Two genuine State issued Licences in CA & NV. Kane was once charged with resisting arrest and assault on police for an altercation in A Hotel Lobby. 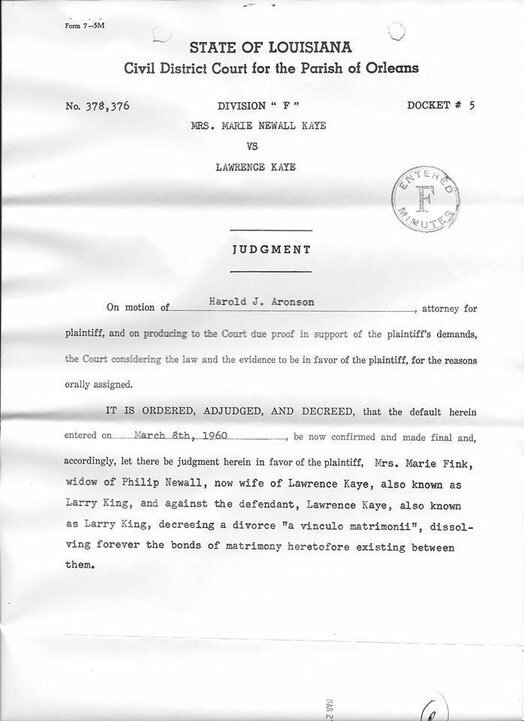 Lawrence Plead not guilty and immediately demanded, and was granted, a trial by Jury. Kane's defense was not only successful in He being found not guilty, but the cop who was alleging the offences against Kane ended up being ordered to give an account of His actions after Lawrence successfully argued He, not the Cop, was assaulted and injured in the altercation. Lawrence was the sole surviving Offspring of Morris and Sarah, who had Three Children born to them in all and all three were Son's. Lawrence was the youngest and both His brothers predeceased Him. What was the 3rd son named? I only know of Kane and Bertram. 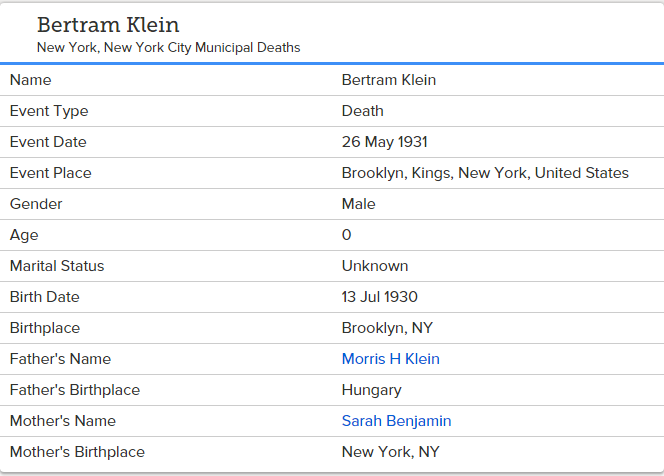 All that Harvey states in His report is The Lawrence was born via Instrumental Birth, the third Son to the Union of Morris H. Klein & Sarah (nee Benjamin Kane) with His brothers both pre deceased, One died at the age of Six, the other Ten Months. WelshChappie wrote: All that Harvey states in His report is The Lawrence was born via Instrumental Birth, the third Son to the Union of Morris H. Klein & Sarah (nee Benjamin Kane) with His brothers both pre deceased, One died at the age of Six, the other Ten Months. Oh ok thanks. Makes ya wonder how the brothers would have turned out if they had lived and become adults. I hope this isn't a dumb question but what is 'Instrumental Birth'? I have never heard of that before. Umm, when they use instruments to deliver the baby. Just means it isn't a natural Birth that's all.